Years ago, there was a restaurant here in downtown Austin called Crimson… I think the restaurant was only open for about 8-10 months, sadly, but they were the wonderful folks who introduced me to spiced pecans. Rather than bread and butter, they would bring you bowls of these delicious, addictive spiced pecans to munch on while you picked out your meal for the evening – I loved it! 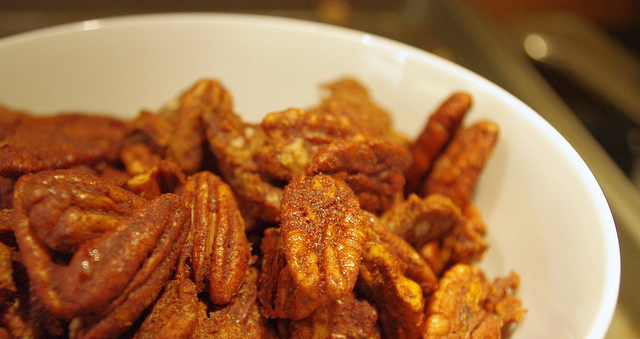 When I was thinking about what to make as an easy snack food for our friends this weekend (at our Paleo Dinner Party), the idea of spiced pecans came to mind. Easy, delicious, and they’d pair really nicely with the very non-Paleo German beer we were having. For inspiration, I looked to a variety of places, including the wonderful Elana’s Pantry. This recipe is my adaptation… I hope you enjoy it! Preheat your oven to 300 degrees F and line a rimmed baking sheet with parchment paper. In a large bowl, briefly whisk egg whites and then whisk in the agave nectar. In a small bowl, combine chili powder, cinnamon, sea salt, and cayenne. Add pecans to the egg/agave mixture and toss to coat. Sprinkle spice mix over pecans and then toss well to evenly coat. Use a slotted spoon to transfer coated pecans to your prepared baking sheet. Bake for about 25 minutes, using a spatula halfway through to stir pecans. Pecans are done when browned and the coating is dry. Remove from oven and cool for 5-10 minutes. These are great served warm! I also loved this because it allowed me to make nuts related jokes all evening… added bonus. Can I use coconut nectar or honey instead of agave? Absolutely – I bet it would be delicious with honey. You may need to play with the amount to get the right sweetness for you. Good luck!